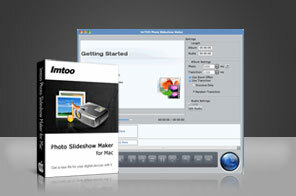 Create wonderful photo slideshows from your photo collections in simplest steps with ImTOO Photo Slideshow Maker for Mac to bring your photos to life instantly. Import your photo collections in format of JPG, JPEG, PNG, GIF, BMP, TIFF, XBM or XPM into ImTOO Photo Slideshow Make for Mac, introduce audios in multiple formats and edit as customized background music, edit photos such as rearrange the display sequence, adjust orientation of images and etc and finally export slideshows to excellent videos in format of AVI, MPEG, WMV, DivX, MP4, H.264/AVC, AVCHD, MKV, RM, MOV, XviD or 3GP. Preserve your photo collections into videos and enjoy a more vivid photo slideshow. Various image formats are supported, including JPG, JPEG, PNG, GIF, BMP, TIFF, XBM and XPM. Go vivid, and you can do more with your photo slideshow. Like insert background music, add transitional effects between images or organize photos the way you want. Multiple output video formats for playback on your iPhone, iPad or iPod, share your photo slideshows with friends or family anywhere. Import your photos or photo folder, drag and drop favorite songs and enjoy excellent photo slideshow videos just a click away. Support exporting created photo slideshows to quality videos in various formats, like of AVI, MPEG, WMV, DivX, MP4, H.264/AVC, AVCHD, MKV, RM, MOV, XviD and 3GP. Insert any audio in format of AAC, AIF, AIFF, AC3, APE, AU, FLAC, MPA, MP2, MP3, OGG, RA, WAV, WMA, M4A into the application as background music to enrich the output slideshow effect. Just drag and drop photos and music to the application to add contents to a photo slideshow video. Organize your photo collections to bring freshness, like turn left, right or flip over the image. Export fantastic photo slideshows to multiple video formats, like AVI, MPEG, WMV, DivX, MP4, H.264/AVC, AVCHD, MKV, RM, MOV, XviD and 3GP. Insert your favorite songs as background music, AAC, AIF, AIFF, AC3, APE, AU, FLAC, MPA, MP2, MP3, OGG, RA, WAV, WMA, M4A audio formats are compatible. Free to create personalized background music, you can clip an audio segment. Perfectly convert, copy, and burn photos to DVD by adding transitional/audio/video effects on Mac OS.